Welcome to the end of your week, and to the newsletter you’ve surely been looking forward to since Monday – the Content Marketing Weekly. Today, we’re going to explore relationships and regrets. Don’t worry; this isn’t a counseling session. It’s therapy for the marketer’s soul. Read on to learn about the harmonious relationship between CMOs and CFOs (and how it can improve), how Google is making it easier to share AdWords data, the biggest content management pain points and successful small businesses’ No. 1 regret from their early years. It seems that Chief Marketing Officers and Chief Financial Officers are, for the most part, getting along, according to research conducted by Wipro Digital. The significance of strong click-through rates may be obvious to a marketer, but it’s critical to explain this fact to colleagues on the financial side. They want to know their real return on investment in hard numbers, rather than having faith in the value of impressions alone. But with 22 percent of CFOs saying their CMOs don’t measure concrete outcomes, many financial officers may be wary of increasing their marketing budgets, or even of their current spend. Assigning a value to click-through rates and impressions isn’t always easy, in part because these metrics can be elusive. Nearly half of CMOs said the vendors they work with don’t have the functionality to provide them relevant metrics, and another 47 percent said finding comparable metrics is challenging because various vendors measure metrics in different ways. Finding ways to directly connect certain metrics to sales could be valuable, though; 94 percent of CFOs said they’d be willing to increase marketing budgets if they saw hard evidence that the money would boost sales. 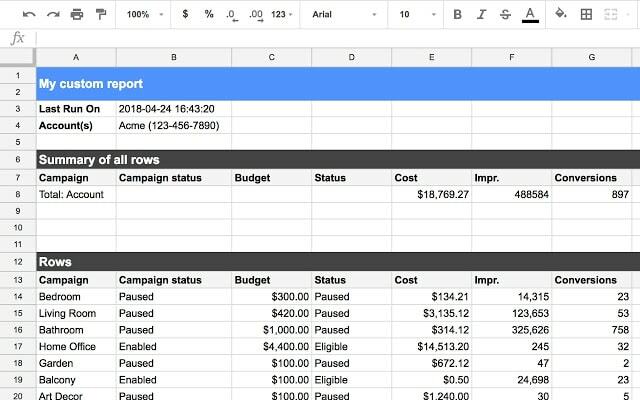 Speaking of a need to clearly demonstrate the value of marketing efforts, Google is working to make organizing AdWords data as easy as creating a new spreadsheet. With a simple add-on and just a few clicks, marketers can populate a Google Sheet with information from their AdWords accounts. Reports can be customized by specifying which columns to include as well as through filters, which exclude irrelevant information. And, reports can be easily shared with others in the same way that any Google Sheet can be shared. This feature is still very new, with only about 500 users so far. Like most new online tools, it’ll likely be tweaked and adjusted in time. But this seems like a good step toward making valuable information like this more easily shareable with all interested parties, whether they’re fellow marketers, a part of the finance department or the CEO. Early on in a business’s life, it might be hard to determine which area of the company to invest the most time, energy and money into. Oftentimes, marketing efforts get pushed aside to make way for other important processes. This might seem practical in the moment, but if you’re anything like the 500 small businesses surveyed by alternative lender Kabbage and research agency Bredin, you’ll soon regret the lack of marketing spend. Most respondents explained they allocated only 7 percent of their overall budgets to marketing in their first year. In retrospect, they wish they had dedicated 28 percent toward marketing strategies. Encouraging business growth must be done through a variety of channels, and marketing is only one of them. However, it’s through marketing that you develop your brand voice, explore your audience’s needs and capture the attention of customers who otherwise may not have known you existed. Which four marketing channels should you target early on? Read more here. 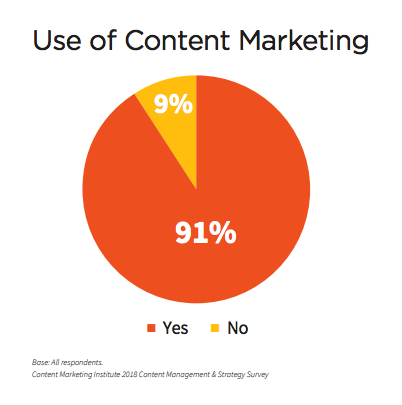 In a survey of 161 organizations, Content Marketing Institute found that 91 percent of respondents were using content marketing strategies, but a large portion of them weren’t as organized as they could be. Nearly three-quarters said they were challenged to strategically manage content, and just 20 percent said they were either “advanced” or “expert” at managing content strategically across their respective organizations. 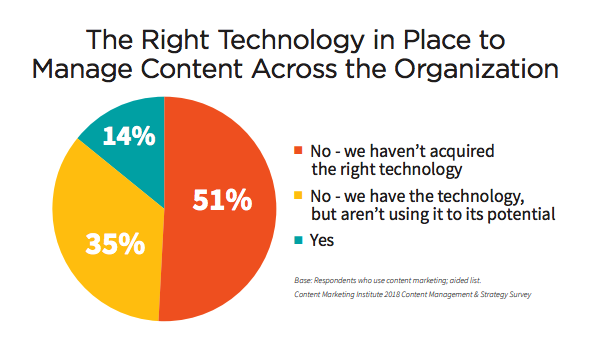 One snag in the process of organizing content could be acquiring the right technology; 51 percent said their companies don’t have access to the best tech for this purpose. But perhaps that’s a symptom of a different issue; only 42 percent of respondents said they viewed content as a real business asset, and 45 percent said they didn’t have a strategy for managing their content as an asset. We already know that most companies look back at their earlier years and wish they had amped up their marketing spend. But what about bolstering their content marketing management strategies? The benefits of doing so include the ability to improve the customer experience, extend the reach of content, repurpose and reuse existing content and more – get more of Content Marketing Institute’s insights here. Whether you’re building the bond between your financial and marketing departments or building out your content management strategy, the Content Marketing Weekly is here to help. We’ll be back next week with more marketing news.